The Zeiss Ikon Super Ikonta 531 is a pocket-sized rangefinder 4.5 x 6 camera. 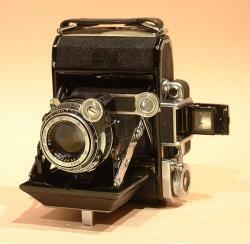 Made from 1937 to 1956, the Zeiss Ikon Super Ikonta 531 is the smallest of the Super Ikonta series. It is very light and fits easily in a pocket. The model shown on the picture has a Compur Rapid shutter with speeds up to 1/500 s but without flash sync. The lens is a coated 75 mm f/3.5 Tessar. The shutter release is on top of the body. The film advance knob has a double exposure prevention system. A coupled rangefinder and albada viewfinder are located on top of the body. This camera is splendid and very pleasant to use. One can wonder what prevents today's camera makers to bring this concept up to modern standards.